Can you show me how to do that? Limit the offset amount and reduce the offset step? I think I have done it for shapes but not for text? nguyenab писал(а): Limit the offset amount and reduce the offset step? nguyenab писал(а): I think I have done it for shapes but not for text? Probably it's because you have two situations: Z from 0 to 2 and Z from 0 to -2 which are mirrored along the 0. That's why you get mirrored cut. 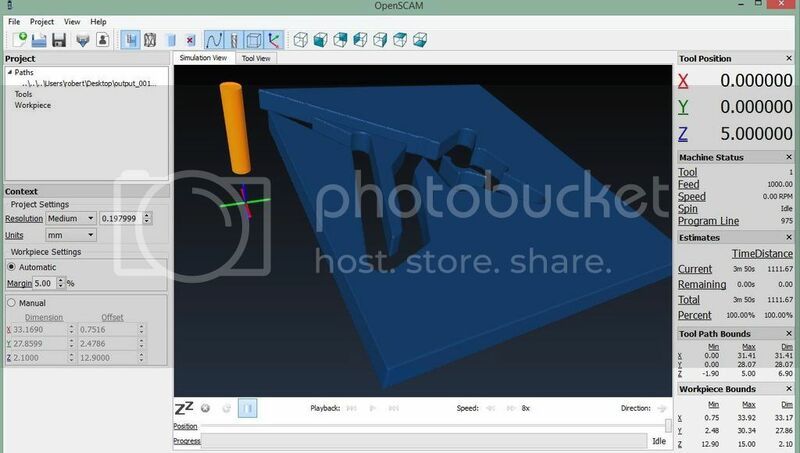 Define both upper limit and bottom limit of machining in orientation points. By the way it's a good practice to assume 0 to be top point of your material - i.e. everything below 0 is material. And make all machining from 0 to -depth. After having the Gcode you adjust offsets in your Control software (using G92 or other Gcodes). Svg is ok, try to do what I suggested. I've been playing with it for hrs and can't make it work right. The Openscam simulation shows opposite of what it should be. When tool position shows 10.0000, the tool is inside the material and cuts its own path instead of objects. When tool position shows -1.00000 then it is above material and just follows the object path in the air. 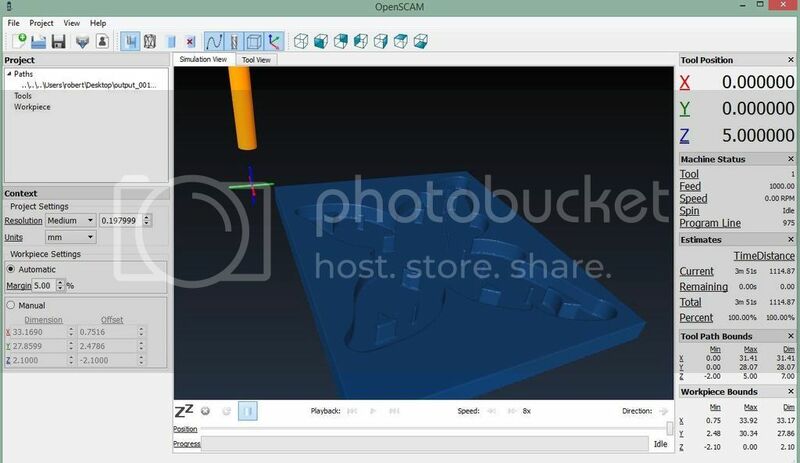 Can you convert my svg file to gcode and run openscam simulation to see whats happening please. It's caused by openscam configuration. By default Z axis points to the top. So Z blow 0 should be material, Z above 0 is air. Check your configuration. Note the unnecessary Z movements, this is at each corner of the path. Without break apart/combine/simplify steps, it's even worse, it does multiple back-and-forth Z-axis movements on each corner. When I edit the generated zigzag path, each corner shows "3 nodes" when I select it. If I join those into one, the Z-axis back-and-forth goes away, and the generated gcode follows an efficient horizontal path. Is this behavior by design? Am I doing something wrong? Other methods of filling the area have similar problems. I used to be able to use gcodetools just fine, but after a hiatus, tried again and can't get it working. Every time I try to convert a path to gcode, the generated file is empty. In fact, it doesn't even have the declaration headers with G and M lines. - SVG file submitted by other users here, including orientation and tool config. Every time, whatever I have is successfully converted to path (clicking it indicates "Path" in Inkscape status bar). - I tried both portable and standard installation packages. As I explained earlier, no matter what combination of all these things I try, gcodetools creates an empty file. Any help please? Did I miss something obvious? Does inkscape say anything? Any errors? It doesn't really matter what path I try, but I just attached an example including a rectangle and a letter converted to path. I do not get any errors, although the "Please wait" message remains a very long time before I get an empty gcode file. Also, I should have stated that I used Inkscape v0.91 with Gcodetools v1.7. However, I also tried gcodetools versions all the way down to 1.4, and still can't get it to generate some gcode. It makes me wonder if the Python script is running at all! I didn't install any other Python interpreter apart from the one bundled with Inkscape. So you do get the "empty file". This means that something is working. By the way do other extensions work, or not? I didn't try before any other extension as all I wanted was your gcodetools extension! But you are right: the other extensions bundled in Inkscape 0.91 do NOT work either! I try to install .Net 4.0 runtime and C++ 2010 runtime, but they do not seem to help. I try to find which other runtime I might need, but couldn't find additional info. C++ 2008 won't even install on this XP machine, not sure why. ... and now it seems to work fine! Thanks again Nick! However, I don't know which one of the 3 is really needed, does anyone know? Hmmm sounds strange.... .Net is not needed for inkscape. Here is a little guide in PDF that i wrote for myself some time ago.